Audi revolutionized the B-segment in 2007 with the introduction of the Audi A5 Coupé – regarded widely as a work of art that took the world by storm. Ten years later, Audi South Africa is proud to present the second generation – now with a new, honed look and packed with the latest technology. The new generation of the A5 Coupé is athletic, sporty and elegant, while its design goes hand-in-hand with sophisticated aerodynamics. Under the skin the Audi A5 impresses with an all-new chassis, powerful engines, and innovative infotainment features and driver assistance systems. The Audi A5 Coupé was launched in South Africa in 2008 and was followed by the 5-door Audi A5 Sportback and the Audi A5 Cabriolet in 2010. 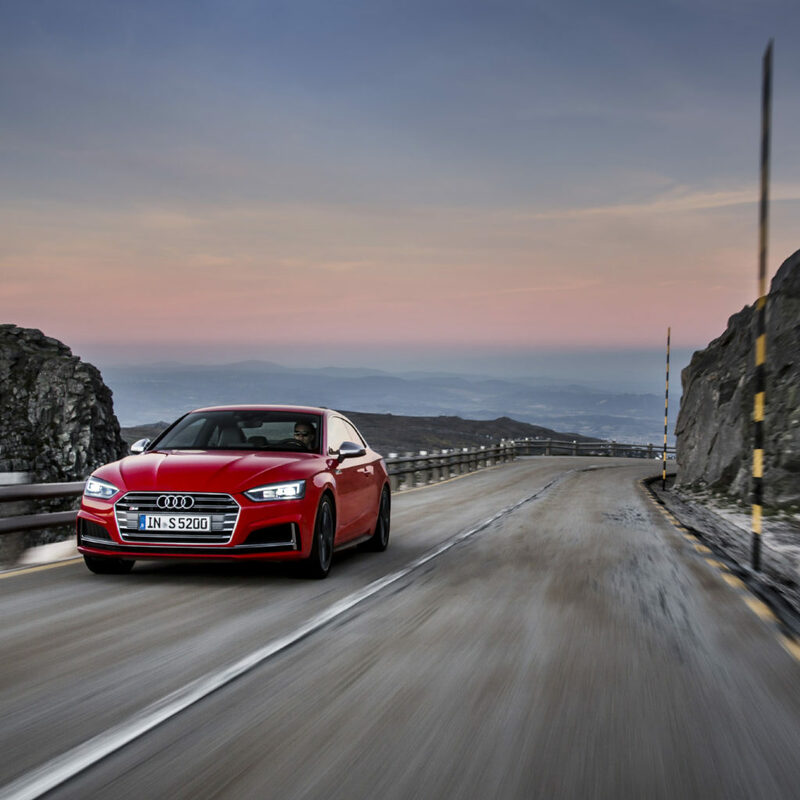 To date, 9,800 of the Audi A5 range has been sold to South African customers. With the new generation, the question widely has been around how Audi would make the previous generation design masterpiece even more beautiful? 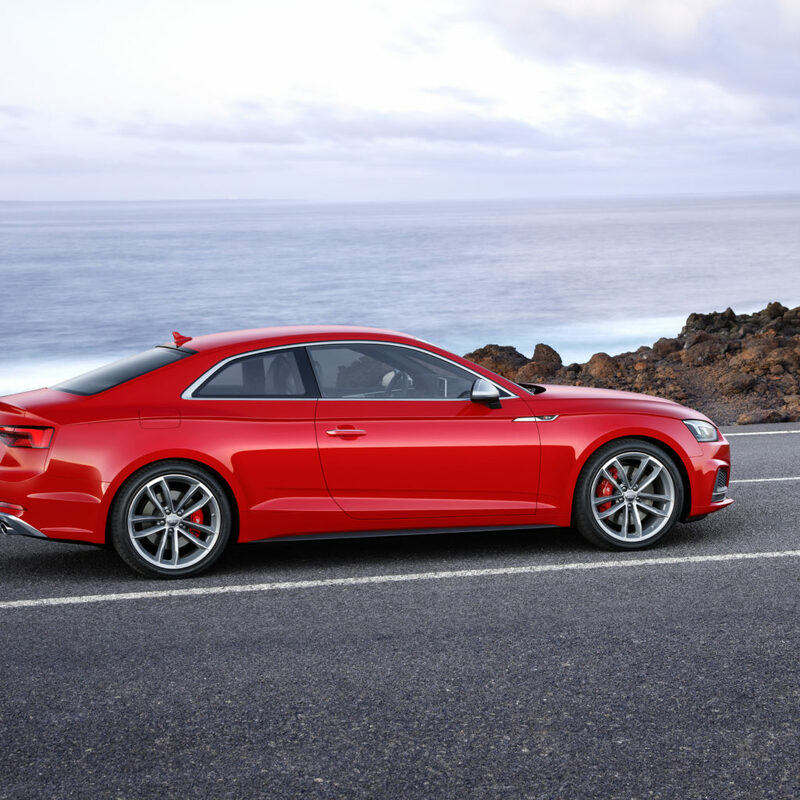 The new Audi A5 Coupé sports a fresh and modern look. It is nevertheless true to its DNA with the sporty and elegant character being passed down to the new generation. The best example is the now three-dimensional wave-shaped shoulder line that already characterized the previous model. The precisely sweeping line with pronounced bulges over the wheel arches emphasizes all four wheels – a cue to the quattro all-wheel drive. 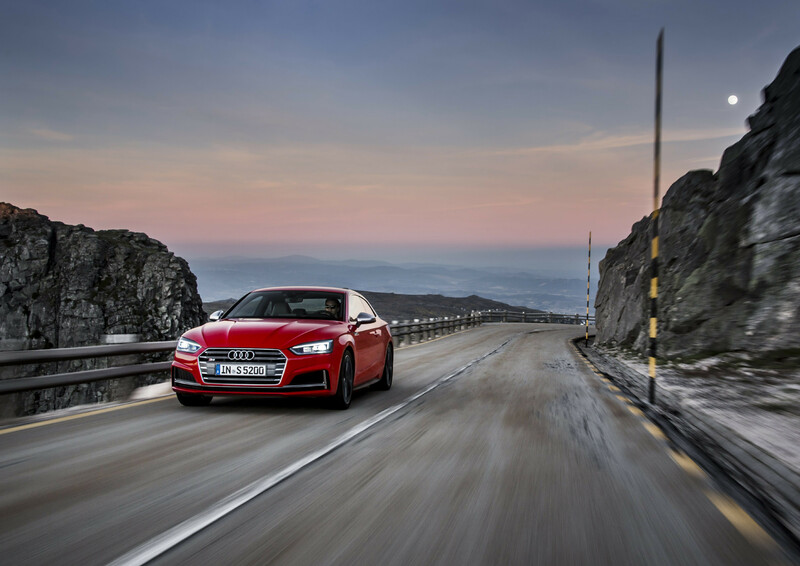 The new Audi A5 Coupé will launch in South Africa with three engines: two TFSI and one TDI unit. 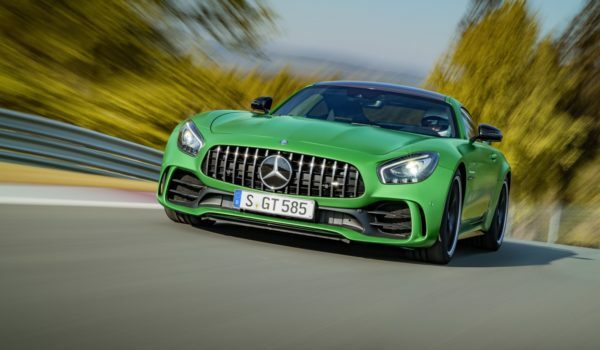 Their power output has increased considerably and is now between 140 kW and 185 kW. Compared with the previous model, they offer up to 17 percent more performance while consuming as much as 22 percent less fuel. All the engines combine high efficiency with sporty power development and smooth running. 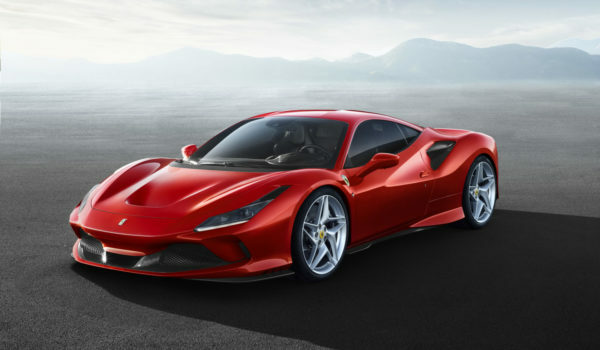 There will be a four-cylinder 2.0T FSI engine producing 140 kW and 320 Nm of torque, accelerating from 0 to 100 km/h in 7.7 seconds. This engine has a claimed combined fuel consumption of 5.1 litres per 100 km, while being exempt from CO2 tax with an emissions figure of 117 g/km. The other petrol engine on offer is also a four-cylinder 2.0T FSI engine producing 185 kW and 370 Nm of torque, however it is couple with quattro all-wheel drive. This variant will complete the 0-100km/h sprint in 5.8 seconds while consuming 5.9 litres of fuel per 100 km in a combined cycle. The sole TDI engine on offer will be in the form of a four-cylinder 2.0 TDI producing 140 kW of power and 400 Nm of torque. This highly efficient diesel engine has a claimed consumption of 4.1 litres per 100 km, while also being exempt from emissions taxation with a figure of 107 g/km. This engine will be available in front wheel drive and quattro, in both cases the customer may choose from a base specification or a Sport specification. 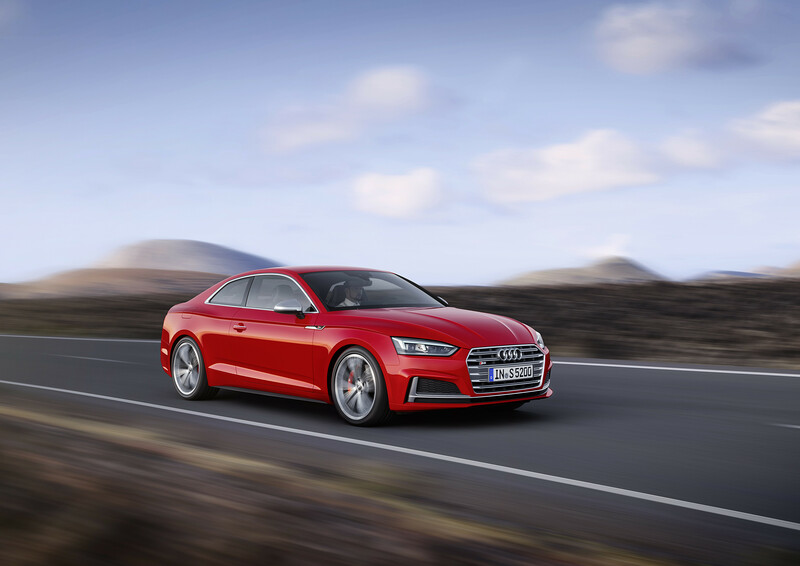 The new Audi A5 Coupé comes with a drivetrain solution tailor-made for each engine variant. 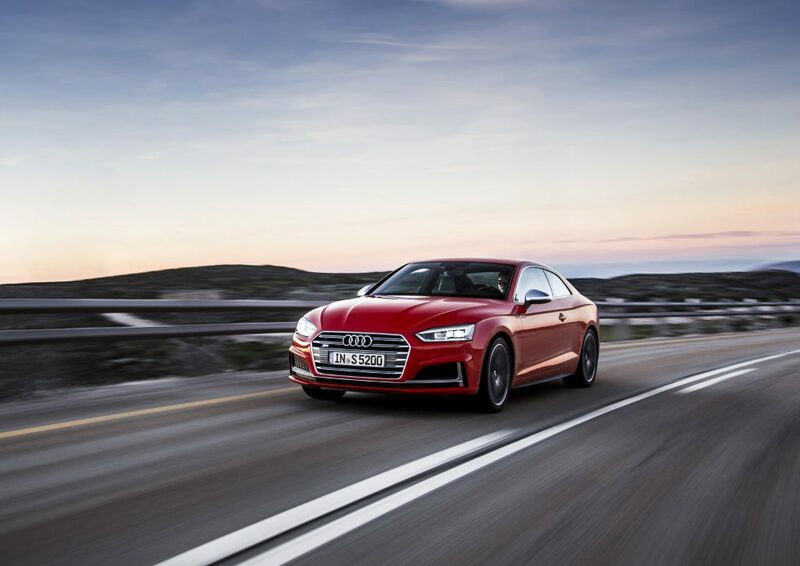 The seven-speed S tronic transmission is used with all the engines, while the Audi S5 features the eight-speed tiptronic gearbox with quattro all-wheel drive. 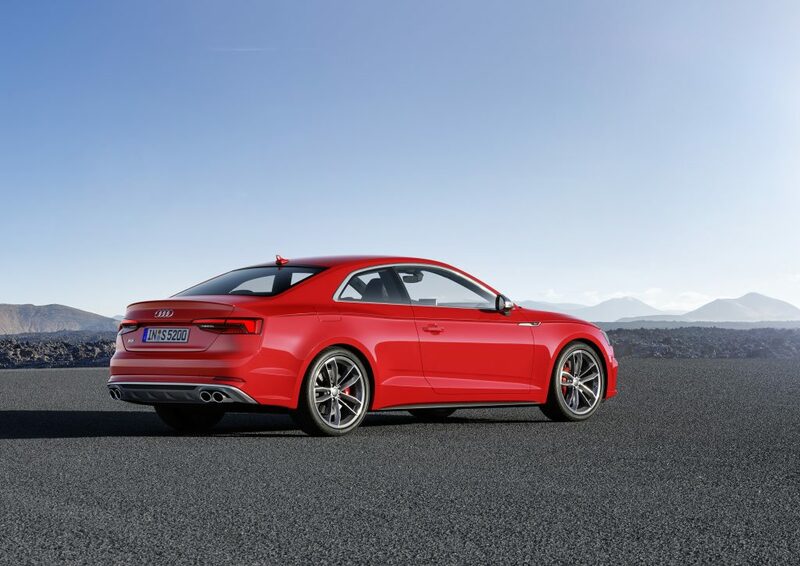 Audi also offers the optional rear-axle sport differential for even more dynamic driving and precision on the Audi S5. 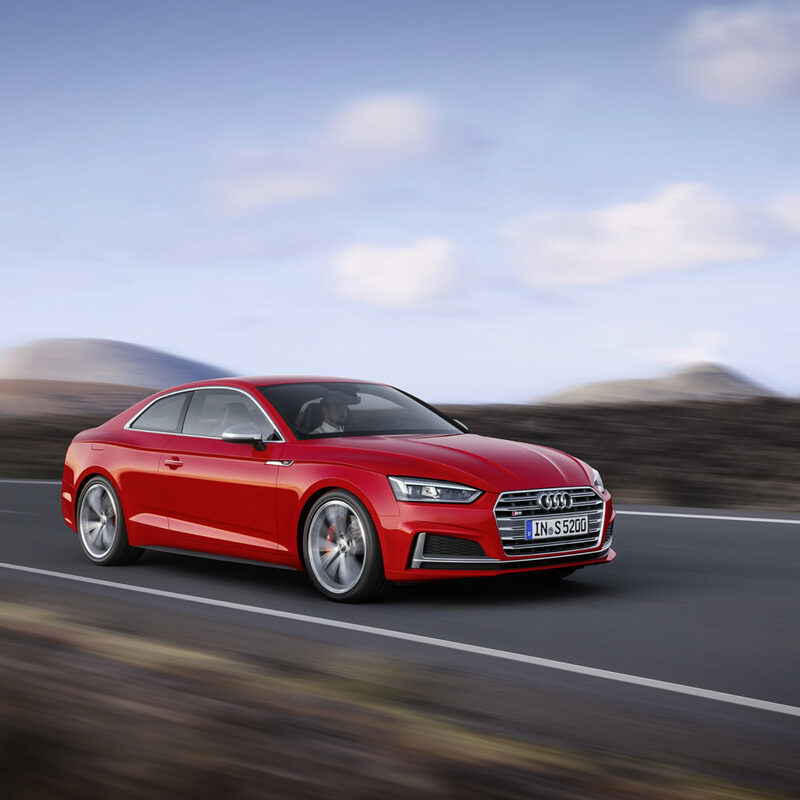 The all-new chassis is among the strengths of the Audi A5 Coupé. It offers the driver optimal comfort combined with a high degree of agility. The A5 thus handles narrow, winding mountain roads and long trips with equal aplomb. Audi offers a suspension with damper control as an option, which is integrated into the dynamic handling system known as Audi drive select, which enables the driver to modify the basic characteristic in multiple steps. The interior benefits from the increased dimensions and longer wheelbase. Space for driver and passengers is more generous. The horizontal architecture of the instrument panel and the continuous air vent strip create a wide sense of space. As is typical for Audi, interior build quality is uncompromisingly high. High-quality materials in a wide range of colors provide for a particularly pleasant ambiance and underscore the premium character of the mid-sized model. Optional ambient lighting highlights the interior with a choice of 30 adjustable shades. 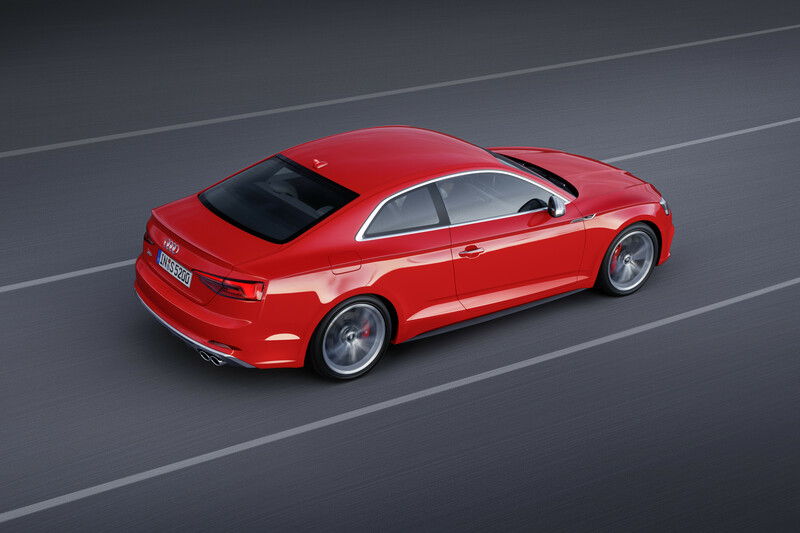 The new A5 Coupé also redefines the class benchmark for aeroacoustics. The acoustic comfort is almost that of a luxury-class model. The luggage compartment offers a volume of 465 litres, 10 liters more than with the previous model. The rear seat has a 40:20:40 split and can be easily folded forward using levers in the luggage compartment. Audi also offers the two-door coupé with optional gesture control for opening the luggage compartment lid via a foot motion. The optional trailer hitch is electrically released at the press of a button. The whole MMI control logic is similar to that of a smartphone, including the intelligent free text search function. The new, more natural voice control system can recognize input made using everyday language. Customers choosing MMI navigation plus automatically also get the hardware module Audi connect which allows the vehicle to be a Wi-Fi hotspot for up to 8 devices, while also accessing Google Earth Navigation and Google Street View. With the Audi smartphone interface, Apple Car Play and Android Auto bring the familiar smartphone environment to the car, if desired. The optional Audi phone box with wireless charging in the centre armrest uses near-field coupling to link smartphones wirelessly to the vehicle’s antenna and enables inductive charging according to the Qi standard. For very discerning hi-fi fans, the Bang & Olufsen sound system with its innovative 3D sound is also available. From its 2,995 cc of displacement, the V6 TFSI produces 260 kW, which is 15 kW more than the previous engine. A constant 500 Nm of torque is available from a low 1,370 all the way to 4,500 rpm. 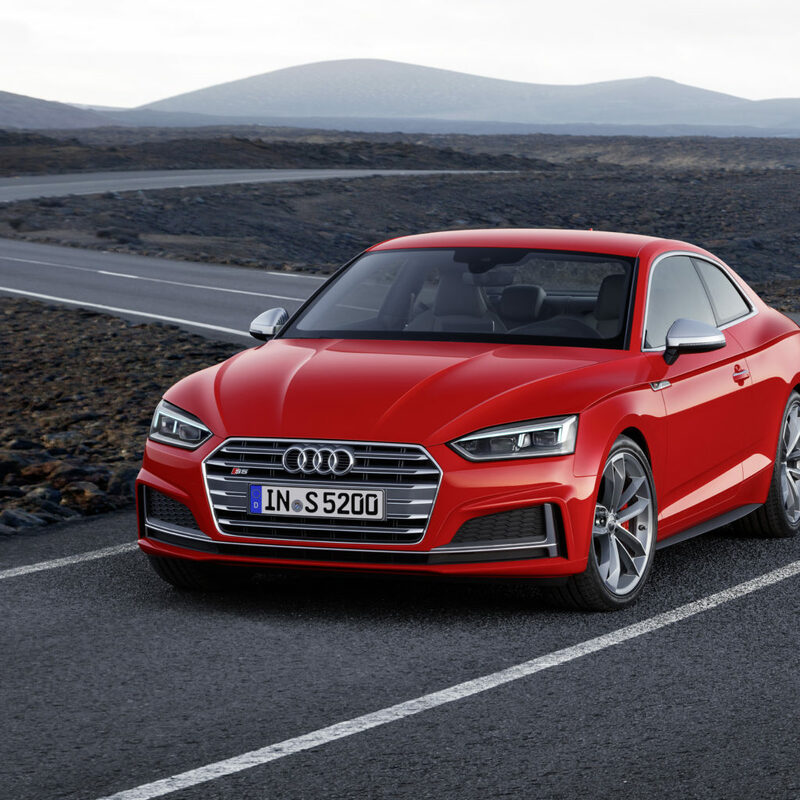 In its combined cycle, the new 3.0 TFSI in the S5 Coupé consumes just 7.3 litres per 100 kilometres – a CO2 equivalent of 166 grams per kilometre. Fuel consumption has dropped by five percent compared with the predecessor engine. The decisive success factor for the efficiency of the V6 3.0 TFSI is the new combustion process from Audi. It is based on what is known as the B-cycle, which utilizes the high-pressure injection valves that are arranged centrally in the combustion chambers. The shortened compression stroke of the updated combustion process enables the use of an engine process with a significantly higher geometric compression ratio in the V6 TFSI. Combined with a power stroke that, while normal, is longer relative to the compression stroke, this allows for more efficient combustion and increased engine efficiency. 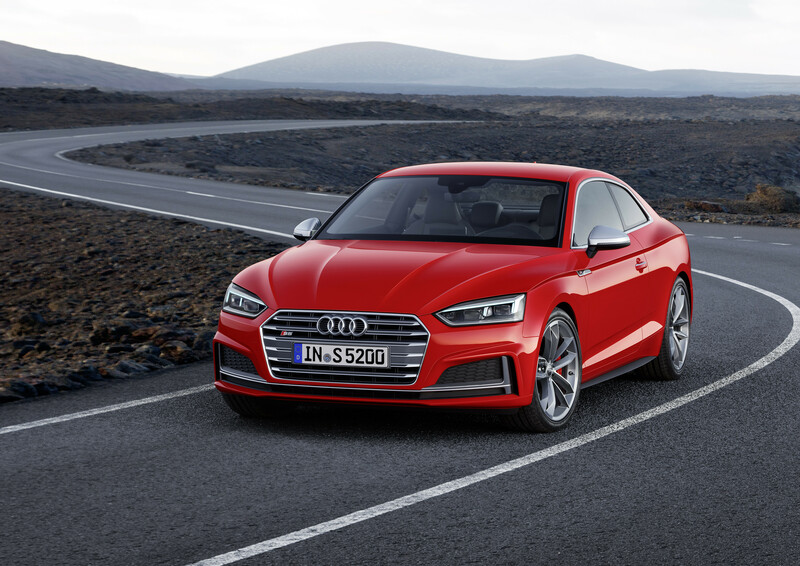 The quattro permanent all-wheel drive system with its asymmetrically dynamic layout makes a major contribution toward sporty and stable handling of the new Audi S5 Coupé. During normal driving, its all-mechanical centre differential directs 60 percent of the torque to the rear axle and 40 percent to the front. If slip occurs at one axle, most of the forces are rapidly redirected to the other axle – up to 85 percent to the front or up to 70 percent to the rear axle. These high locking figures enable a clearly defined torque distribution and precise interplay with control systems. 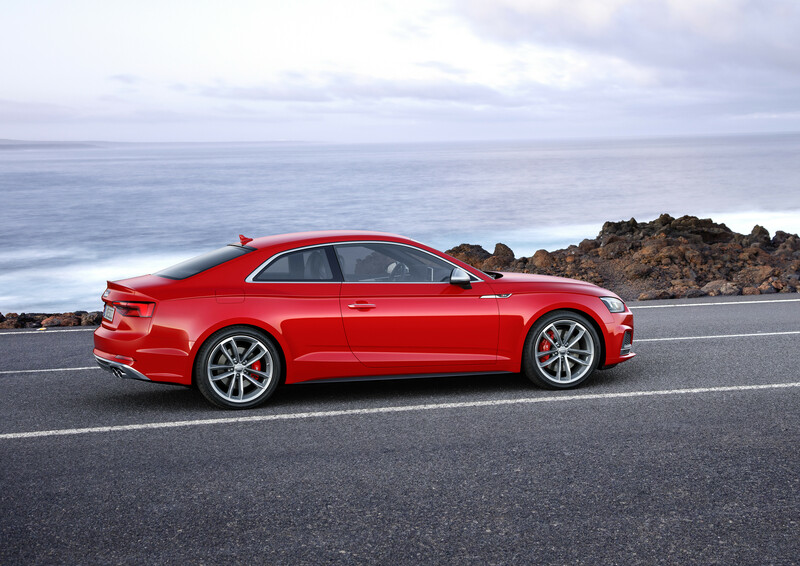 When viewed from the side, the new Audi S5 Coupé exhibits a characteristic, wave-shaped shoulder line. The sweeping line with pronounced bulges over the wheel arches is a visual cue to the quattro all-wheel drive. 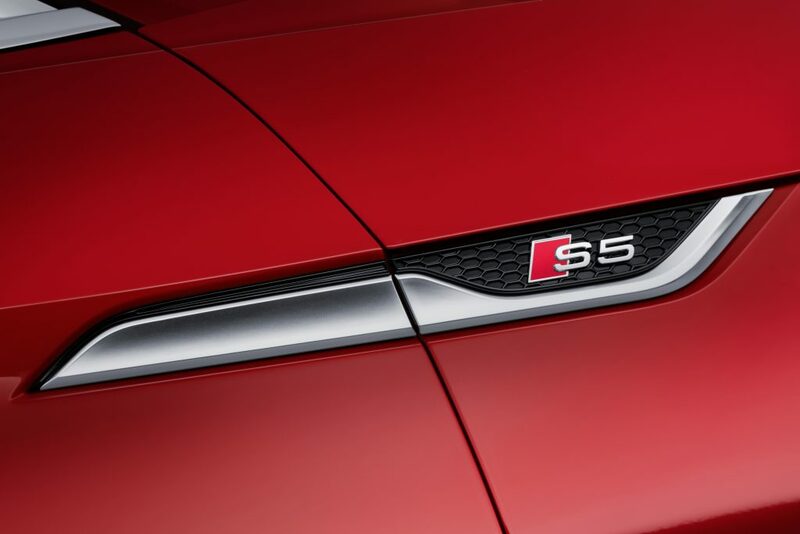 At the transition from the front wheel arch to the A-pillar, a three-dimensional trim element in matt aluminum silver with an integrated S5 logo underscores the supreme sportiness of the new Audi S5 Coupé. The rear end sports slim LED rear lights with dynamic turn signals. A distinctive spoiler in the body color on the luggage compartment lid improves the aerodynamics. Integrated into the boldly shaped rear bumper is a flat, black honeycomb grille. The matt twilight gray diffuser with vertical struts and a matt aluminum silver clasp frame the two dual chrome tailpipes. The new Audi S5 Coupé also features cultivated sportiness in the interior. The clean design with its strong horizontal orientation makes the spaciously designed interior – which seats four – appear even larger. 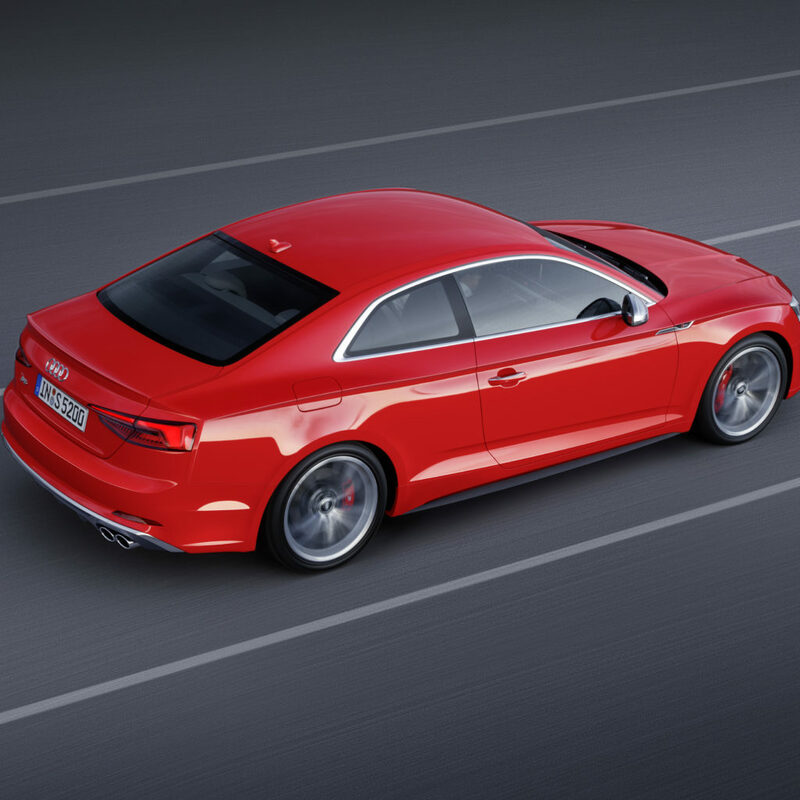 With a volume of 465 litres the luggage compartment of the S5 Coupé offers everyday practicality. New trim lines provide numerous customization opportunities, for both the interior and the exterior. Besides the base model, there is also the sport line which offers additional equipment to enhance the sporty look of the vehicle. The S line sport package and the Audi design selection are available for sophisticated customization, particularly for the interior. Audi offers the S line exterior package for a particularly dynamic appearance.